"The mechanism of the vertical circulation of the waters of the oceans". 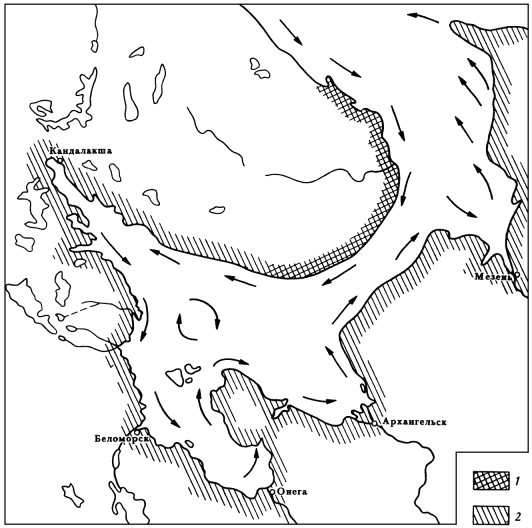 The reason for the formation of hydrogen sulfide in the Black Sea. As is known, everything that rotates, including whirlpools, has the property of a gyroscope (whirligig) to maintain the vertical position of the axis in space, regardless of the rotation of the Earth. The presented theory can easily be verified by relation between the oxygen content and the whirlpools rotation speed. Based on the map of the depths and currents of the seas and oceans. Black Sea. East of the Mediterranean. Gulf of Mexico. Norway fjords. V - whirlpool rotation speed, km / h.
G - depth of the reservoir, km. Vertical movement of ocean waters can be convincingly modeled using simple experience. For this, a half-filled vessel with a rotating liquid (bucket, tumbler, mixer) must be rotated around itself (in orbit). Vertical and horizontal circulation is a vital fundamental law of nature, without which life in the ocean would be impossible. During the vertical and horizontal circulation, there are also side non-vital effects of nature: ebb and flow, seasonal sea-level rise, killer waves. Seasonal increase in the level of waters of the seas and oceans. The waters of the lakes, seas and oceans of the northern hemisphere rotate counterclockwise, and the waters of the southern hemisphere rotate clockwise, forming cyclonic gyres. The main cause of rotation of the whirlpools are local winds, flowing into the seas and oceans of the river and the deflecting force of Coriolis. And the higher the speed of the winds, the higher the speed of rotation of the whirlpools, and as a result, the higher the centrifugal force of the whirlpools, thereby increasing the water level of the seas and oceans. And the lower the speed of rotation of the whirlpools, the lower the level of water, seas and oceans. The speed of currents along the perimeter of the seas and oceans is not the same everywhere and depends on the depth of the coast. In the shallow part of the seas and oceans, the flow moves fast, and in the deep water part of the seas and oceans the flow moves slowly .. Seasonal rise in the water level is observed not along the entire coast of the seas and oceans, but only on those coasts where the high angular velocity of the currents and, as a result, the high centrifugal force of the water. (Centrifugal force F = mv2 / r). On straight coasts, where currents do not have an angular velocity, the water level does not rise. The waters of the Gulf of Finland rotate counterclockwise, forming a whirlpool in the form of an ellipse. And when the seasonal south-westerly winds unwind the whirlpool to 5 km / h, the centrifugal force of the whirlpool rises, so that on the east coast of the Gulf of Finland the water level rises to 30 cm. A similar pattern of seasonal increase in water levels is observed in all lakes, seas and oceans .. The average depth of the Gulf of Finland is about 50 meters, on the east coast is about 5 meters, in the west of the bay it is about 100 meters, for this reason the linear and angular velocity of currents on the east coast of the Gulf of Finland is much higher (as much as the depth of the coast increases current velocity) .. In the Gulf of Finland, the seasonal increase in water levels has two peaks: in August-September and in December-January and in time they coincide with the season of south-westerly winds. The speed of the current in the Gulf of Finland reaches from 2 to 17 km / hour, and the maximum speed of the current on Earth reaches 30 km / hour, the wind speed is more than 100 km / hour. The waters of the North Sea rotate counterclockwise, forming a huge whirlpool. And when seasonal northwestern storm winds unleash a whirlpool (up to 20 km / h on the southern coast), the centrifugal force of the whirlpool rises, making the level on the southern coast of the North Sea up to 5 meters. (Storm surge 2.5 meters, centrifugal surge 2.5 meters). The waters of the Caspian Sea rotate counterclockwise, forming a whirlpool in the form of an ellipse. And when the seasonal winds and the flood river Volga unleash a whirlpool, the centrifugal force of the whirlpool rises, making the water level up to 1 meter on the north coast of the Caspian Sea. The average depth of the Caspian Sea is about 200 meters, on the north coast about 5 meters, on the south coast - about 500m. Due to this, in the north of the Caspian Sea the speed of the current increases from 1 to 10 km / h.
In the Caspian Sea, the peak of the seasonal rise in water level is observed in June-August and coincides in time with the season of winds and high water of the Volga River. During a drought over the Volga River basin, the level of the Caspian Sea does not rise. In the Bay of Bengal, in the season of monsoon winds, the whirlpool speed rises to 10 km / h, making the seasonal rise in water levels up to 1.2 meters. Seasonal increase in the level of the Black Sea (up to 40 cm) is most pronounced in the southeastern part of the sea, where in summer the angular velocity of the currents reaches its maximum value. The assumption that the cause of the seasonal rise in the water level may be the pressure of the atmosphere, the flow of the rivers, the temperature difference and the salinity of the waters do not hold water, these factors may raise the water level by a few cm, but no more. The presented theory can be easily verified by relating the velocity of the currents to the level of the seas and oceans. (Based on a map of depths and currents, seas and oceans). High and low tides are the result of the earth rotation and of the whirlpools. There is a strict pattern - tides are formed not along the entire coast of the seas and oceans, but only on those coasts with a high current velocity, and the higher the velocity of the currents, the higher the amplitude of the tidal wave. No tides are formed on these coasts where currents do not have a high velocity. As is well known, everything that rotates, including whirlpools, has the property of a gyroscope (whirligig) to maintain the vertical position of the axis in space, regardless of the rotation of the Earth. 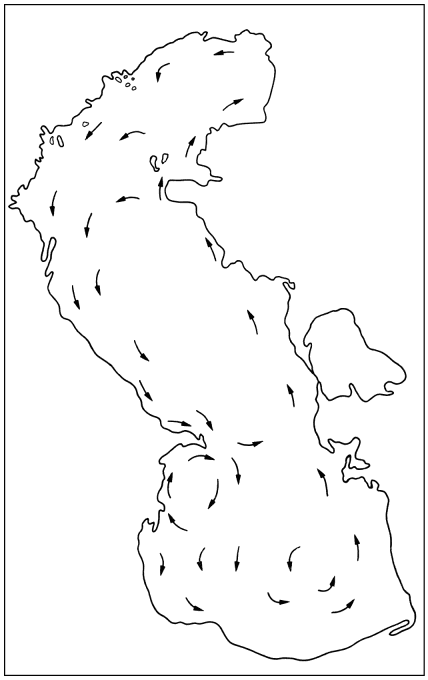 The waters of the White Sea rotate counterclockwise, forming a huge whirlpool-gyroscope, which, while precessing, reflects a tidal wave along the entire perimeter of the White Sea. A similar pattern of tides is observed in all lakes, seas, and oceans. The tidal wave in the Amazon River is created a huge planetary whirlpool with a diameter of several thousand kilometers, rotating between South America and North Africa, covering the mouth of the Amazon River. The tidal wave length depends on the whirlpool diameter. And the tidal wave height depends on the whirlpool rotation speed, the Earth orbital velocity, and the whirlpool tilting time (12 hours). where: A - tidal wave amplitude (precession angle). V1 - whirlpool rotation speed. V2 - the Earth orbital velocity. t - whirlpool tilting time (12 hours). Table of the dependence of the amplitude of the tides on the speed of the current, on any coast. The amplitude of the tides also depends on the size of the whirlpool, the amount of water under the whirlpool, the distance from the coast to the whirlpool and the direction of flow (north, south, west, east). Currents that move along the equator, reflect from themselves a higher tidal wave than currents that move along the meridian. The whirlpool theory of tides can easily be verified by relating the height of the tidal wave to the speed of rotation of the whirlpools. From the height of the tides, you can determine the speed of the current along the coast, based on the atlas of sea currents in real time. The animation shows how the waters flowing from the Bay of Fundy into the Bay of Man rotate the whirlpool, so that, whirling, precessing reflects the tidal wave in the direction of the Bay of Fundy. During the flood of the rivers flowing into the Bay of Fundy, the current speed in the north of the Gulf of Maine rises to 20 km / hour, as a result of which the height of the tides reaches 18 meters. A tidal wave moving across the ocean is called a soliton. When a soliton collides with the coastline of the continent, ebbs and flows are formed. When solitons collide, two adjacent whirlpools, a killer wave is formed. This can be checked by throwing two stones at the same time in a bath of water. When a soliton collides, the resulting killer wave foams and a larger wave pulls a smaller wave somewhat. You can create a half-meter-killer wave with a duration of 0.5 seconds, if two divers simultaneously jumped with a “bomb” into the reservoir from a height of 2 meters, with a distance between them of 3 meters. If you throw two pieces of sugar into a glass of tea at the same time and a killer wave forms there. The mechanism of formation of a tidal wave in rivers and killer waves in the oceans is similar, and the height of the tidal wave in a river depends on the speed of the flow of water in a river. The location of the possible stoning of the killer waves can be predicted from the whirlpool charts and, accordingly, to lay routes. An approaching killer wave or tsunami can be partially neutralized by creating a series of oncoming waves, torpedoes or projectiles. If two waves do not collide with each other, then they freely walk on the ocean, and they are called solitons or Rossby waves. "Three sisters are a collision of a soliton with three storm waves ..
Solitons, reflected around themselves in whirlpools, colliding with storm waves, create a killer wave and are the main cause of ships wreck. And knowing the distribution schedule of solitons by whirlpools, one should accordingly choose the time and route of movement in the seas and oceans. The perimeter of the seas and oceans, I believe, is the most dangerous place for anchorage and movement of ships, especially where there is a high whirlpool speed. The center of the whirlpool, I believe, is the safest place to wait out bad weather, and it is advisable to install a buoy in the center of the whirlpool. The map shows the areas of the most frequent occurrence of killer waves. In the North Atlantic, killer waves form mainly along the perimeter of the North Atlantic planetary whirlpool, as a result of a collision of a tidal wave with storm waves (three sisters) .. The animation shows how in the area of ​​the Bermuda Triangle, as a result of the collision of tidal waves reflected by the North Atlantic and South Atlantic planetary whirlpools, a killer wave is formed .. The clock set on the animation shows that killer waves in the Bermuda Triangle are formed twice a day at 12 and 24 hours. Based on the demonstrated animation, you can make a calendar of formation of killer waves not only for future years but also for previous ones. In the season of long, eastern winds in the north of the Sea of ​​Okhotsk and floods of the rivers flowing into the Penzhinsky Bay, the current speed in the north of the Sea of ​​Okhotsk increases several times, due to which, in the north of the Sea of ​​Okhotsk, the water level, the amplitude of tides and killer waves increases. All physical processes that occur in the ocean, occur in the atmosphere and in the mantle of the earth. "The laws of nature are universal." Scientific journal "NBICS-Science. Technologies" No. 4/2018. Page 104. Continued: The mechanism of the vertical circulation of the waters of the oceans. Criticism of the lunar theory of tides. Why is the tidal wave height three times lower in the equatorial zone than in temperate zones? According to the lunar theory of tides, the crust at a latitude of London rises and falls twice a day with an amplitude of about 20 cm, and the amplitude at the equator exceeds 50 cm (2.5 times more). Then why in the equatorial zone the amplitude of the tides ranges from 0 - 6 meters and in temperate zones from 0 - 18 meters? The highest tides on Earth are formed in the Bay of Fundy in North America - 18 m, in the mouth of the River Severn in England - 16 m, in the Bay of Mont Saint-Michel in France - 15 m, in the lips of the Sea of ​​Okhotsk, Penzhinskaya and Gizhiginskaya - 13 m , at Cape Nerpinsky in the Mezen Bay - 11 m.
1. That the "Moon tidal wave" floods both the western and southern and northern shores of the continents. 2. That the speed of the tidal wave of 1600 km / h is destructive for both continents and marine fauna ..
3. That at the same time around the globe, there are not two tidal humps, but more than a hundred, regardless of the location of the Moon. Laplace undertook the departure of the errors of the Static Theory of Tides, proposing a Dynamic Model of the tides, allowing for a lag (up to 800 km / h) and turning the tidal hump due to friction on the ocean floor. And to show the magnitude of the backlog of the hump, they introduced an application clock (from 0 to 12). 1. While the tidal wave makes one revolution around the Earth, the Moon makes two turns, how is the gravitational connection between the Moon and the tidal hump carried out? 2. If the applied hour is zero, it means that the friction of the tidal wave against the ocean floor is absent, and the wave speed is 1600 km / h, and if the applied hour is 12, it means that the friction reduced the speed of the tidal wave to 800 km / h .
Why, in one area there is friction of the tidal wave on the ocean floor, and in another area there is no. 3. In order for the “Lunar tidal hump” to exist, heterogeneity of the gravitational field is necessary, and for this, the Moon must be constantly above the hump, otherwise the hump will collapse. 4. If the moon created a tidal hump on the Earth, it would not be an ellipse, but a drop. (Gravitational force is added, not compensated). 5. Tidal waves are synchronized with the daily rotation of the earth and are 50 minutes daily behind. The moon is not synchronized with tidal waves. (The moon is one, and the tidal waves on Earth, hundreds). 6. As the current of the western winds manages to move from west to east, at a speed of 5 km / h, rubbing the ocean floor, while the tidal wave flows from east to west at a speed of 800km / hour, rubbing the ocean floor. 7. It is believed that the cause of the second moon hump is the barycenter. And what is the cause of the second solar hump? 8. Who is the author of the theory of tidal resonance and why this theory is not on the Internet? 9. As the tidal forces of the earth stopped the rotation of the moon, if the side of the moon facing the earth is concave, and the reverse side of the moon is convex. Laser altimeters of the Apollo-15, -17 spacecraft showed that the visible side of the moon lies below the average level, and the invisible side lies above it ..
artificial satellites of the moon with a radius of the orbit of more than 10 thousand km. break out of orbit. 11. Why do tidal waves move strictly along the perimeter of lakes, seas and oceans, and not from east to west, following the moon? this is a point in the ocean, where the amplitude of the tidal wave is zero, the tidal wave "runs around" this point around clockwise or counterclockwise ..
13. Why in the equatorial zone, the amplitude of the tides is three times lower than in temperate zones? 14. Why on the northern and southern coasts of the seas and oceans the tides are three times higher than on the eastern and western coasts, but it should be the other way around. 15. How to explain the fact that in the port of Freemantle in southwestern Australia, the tides of the year are significant, and then disappear. Once a year, in the delta of the Northern Dvina, during the spring floods, the ebb and flow of the mysteriously disappear for several days, sometimes for a week, and this is considered one of the mysteries of nature. 16. Why in the White Sea tides are 100 times higher than in the Baltic Sea. The height of the tides in the White Sea is 10 meters, and in the Baltic 10 cm. 17. On which theory relied Chinese calendar tides 1100.